Is Your Bookkeeping Saga Like Mine? I grew up thinking that personal bookkeeping was too complicated for me. I was a 'words', not a numbers person. Life should just face it, and leave me alone. I did my best to pay any bills on time, and then manage my wants out of what was left over. But I had no plan or budget. No one had ever taught me anything about financial bookkeeping. Later in life I learned that budgeting is basically a carefully thought out plan for how I will get money, how I will spend it, and recording it so that I can see my progress. You can start small-scale, but once you see the value in it, you can expand and develop your personal bookkeeping system. In 1983, after 16 years on my own, I moved back to care for my aging parents. I didn't want to be just a maid, but rather a freelance writer, so I prepared some record-keeping sheets as I had read you should do if you were self-employed. Whenever I got a small job, or sold some article I recorded it. Later I was able to add some self-published books, but everything was on a very short shoestring budget, and I used that phrase "personal bookkeeping" loosely. I had to stay debt free, and so learned to be ever more frugal, and to pray for funds even to buy stamps sometimes. But that was all part of my education! My sister Elsie had written an easy-to-use one-year accounting, budget and personal accounting book. When her marriage broke up she took the two children and moved to the west coast to train for a new career as a Health Inspector. She left a lot of stuff in storage at our parents' home, including her unsold copies of the book, The Color of Money. I decided to try it out with my parents' pension and expenses. I kept it close to the table where we ate our meals, so that I could quickly enter a number if one of us brought in a receipt for anything bought in the previous hours, or whatever checks had come in the mail. All the receipts for any given month went into a used envelope and inside the cover pocket of The Color of Money. It took a little persistence to get us all in the habit of recording household expenses and their personal bookkeeping, but later on, we could see at a glance how much had been spent, and how much was left for bigger items. Not one of the three of us had studied personal bookkeeping or accounting, but just following the instructions Elsie had put into this book was sufficient. I was soon impressed at how this tracked expenses. Mom's prescriptions didn't seem so huge now when we saw how they were spaced, expense-wise. Dad could see we could not afford another car. He also cut back on what he spent at auctions. (Well, most of the time). Filling out their tax returns was a breeze after I copied the monthly sums to the year-end summary page! I believe Mom could have handled this way of personal bookkeeping years before if she'd had such a book, despite her limited English education. Mom died in 1997 and when I had my novel ready to sell, I wanted to go online. I'd been reading about publishing on the internet. This meant I must become a business woman in ernest now! I was finally ready to learn how to do business bookkeeping, but I couldn't find anyone who would teach me for free. So I finally researched it online and learned to do it on my own, addding to what I'd learned with The Color of Money. See! If your family needs to track money flow, The Color of Money can do that for you. It's so simple that even those who have never used a computer, or finished their primary education, can use this how to accounting book for personal bookkeeping, or for family record-keeping. Elsie is busy with her new career, and I'm back on my own since Dad died, and am busy as can be with too many commitments, however - I've decided that I can sell The Color of Money from this website for Elsie on the side, and get the books out there where they can do others some good. 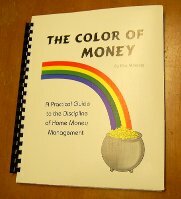 At present there are a limited number of copies of The Color of Money. I can't guarantee that Elsie will do another printing, so you may want to stock up with your order now. $ Goal One - learn to budget so you can get out of debt. The smartest budget is one that has you spending less than you earn. $ Goal Two - keep your balance in the black in your personal bookkeeping, while you increase assets. You'll be smiling more. $ Goal Three - when budget and debt is mastered, time to invest in the future! This is when personal bookkeeping gets to be more fun! You need The Color of Money to accomplish those goals. It can certainly help. So order a copy or two right away. It's ideal to begin at the beginning of January, but you can start any time of the year. (If you start later, just begin on that month's page and when done with December start using the pages for the earlier months that you missed). Buy Now Buttons: PayPal and Payza. Include your mailing address and contact info. In this case, please allow enough time for me to receive your mail before I put your The Color of Money into the mail for you. If you should choose to use MoneyGram or Western Union just give them my address above, but then you must email me to give me the Transfer number, and which option you used. Also - again, I can't send the book to you without the mailing address where to send it. If you have any questions, or to let me know the money is on the way, here's how to reach me.